Hamas would consider renewing the expired Gaza truce if Israel respected its initial conditions, leaders of the Palestinian militant group have said. Hamas was ready to stop firing rockets if Israel stopped its "aggression" in Gaza and opened up border crossings, spokesman Fawzi Barhoum told the BBC. 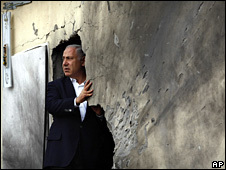 On Sunday Hamas said it would stop rocket fire into Israel for 24 hours at the request of Egyptian mediators. Some 50 rockets and mortars have been fired since the truce ended on Friday. But most of those were launched before the 24-hour lull was announced. Hamas spokesman Ayman Taha said the day-long ceasefire had been agreed between militant factions in Gaza "to give a chance to the Egyptian mediation and to show that the problem was always on the Israeli side", Reuters news agency reported on Monday. But Israeli press reports suggested it may have been linked to an aid delivery from Egypt through the Rafah border crossing on Monday. Under the Egyptian-brokered six-month truce, Palestinian factions in Gaza reduced rocket attacks on communities in southern Israel, and Israel largely halted military operations in the strip for several months. But both sides say the other failed to fulfil its obligations under the unwritten agreement. Israel says Palestinian rocket fire did not stop completely, weapons smuggling through tunnels from Egypt continued and no progress was made on the release of captured Israeli soldier Gilad Shalit. Hamas complains that Israel did not lift its embargo on the entry to Gaza of virtually all but basic humanitarian supplies. Violence began to escalate again after 4 November, when Israel launched an incursion targeting what it said was a tunnel which could be used to abduct soldiers. 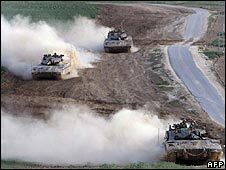 Since the truce ended, Israeli politicians have been threatening a major military offensive in Gaza if the rocket fire does not stop. But correspondents say the situation is complicated by Israeli general elections due on 10 February. The two leading candidates to become Israeli's next prime minister, Foreign Minister Tzipi Livni and Likud party leader Binyamin Netanyahu, have vowed, if elected, to topple Hamas in Gaza. Ms Livni, who is currently foreign minister, has been invited to Egypt for talks on the situation on Thursday.